Facet joint injections are used for the purpose of diminishing the pain experienced by the patient in his facet joints which are located at the back of the spine and offer both flexibility and stability to the body. These injections are administered into the facet joints of the patient to decrease the inflammation and swelling present there which had been causing the pain. What are the major indicators for having Facet Joint Injections? The indications for facet joint injections are referred pain, axial pain or an implication that the facet joint is responsible for causing a pain syndrome of the spine (Weissman, 2009). People suffering from facet joint syndrome are ideal candidates for receiving facet joint injections. These injections have the capability to reduce pain which is the most crucial symptom of facet joint syndrome. In addition to this, sufferers of arthritis who no longer have cartilage present in between their facet joints will also find these injections very useful as they can minimize the pain caused by the stress applied on the joints, because of the absence of the cartilage. Moreover, people who have been involved in an accident in which their facet joints have been injured can also find relief from their pain by making use of these injections. Diagnostic – may tell the pain doctor if that particular joint is the source of a person’s pain. What does Facet Joint Injections entail? 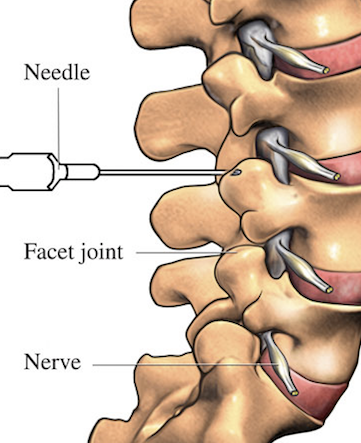 Facet joint injections involve the use of a hypodermic needle which delivers a small quantity of anesthetic or anti-inflammatory medication into the facet joint of the patient under the guidance of a fluoroscope. Steroid medicine is also place, or a regenerative medicine substance like Platelet Rich Plasma Therapy or stem cells are used. The anesthetic is used to block the nerves from sending pain signals to the brain while the medication performs the task of reducing the inflammation. Initially the facet joint injections are used for delivering the anesthetic to confirm that the pain being felt by the patient is emanating from the joint. Once it is confirmed then the anti-inflammatory drug is injected using the facet joint injections. How does Facet Joint Injections help the doctor provide treatment? Facet joint injections are both a treatment as well as a testing procedure. When used for delivering an anesthetic to the facet joint, these injections help the doctor in assessing whether the facet joints are the real cause of the pain being felt by the patient or not. On the other hand, when used for delivering an anti-inflammatory drug, the facet joint injections offer the doctors an effective method of managing the pain of their patients. According to Smith (2009), facet joint injections with steroids are highly effective for treating facet joint syndrome. What to expect when having Facet Joint Injections? 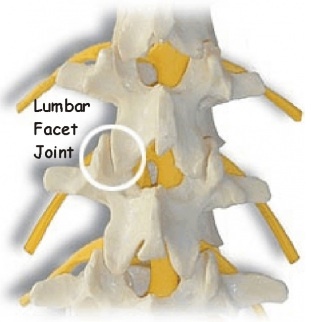 The administration of a facet joint injection is not a very complex procedure. It takes only about half an hour and can be performed in an office with ease. The patients are asked to remain away from intensive activities prior to the procedure. The procedure requires the patient to lie on his stomach. The doctor cleanses the skin over the facet joint before inserting the needle. At first a dye is inserted to make sure that the needle is placed in the right position inside the joint after which the medication or the anesthetic are injected into the joint. What are the risks of having Facet Joint Injections? Since administration of facet joint injections is an invasive procedure, it does have some risks which include bleeding, infections and worsening of the pain after the injection has been administered. Since the needle does not go into the spinal canal at all, there is absolutely minimal risk of a spinal cord or nerve root injury. What are the benefits of having Facet Joint Injections? The biggest benefit of facet joint injections is that they can provide immediate relief to the patient from the pain and may last for weeks to months. Then it can be repeated. The injections may be performed with steroid or regenerative medicine substances like PRP or stem cells. 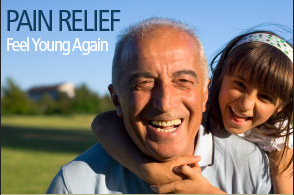 Call Seattle Pain Relief today for back/neck treatment that is expert. For the top nonoperative treatment to help change your life, call for pain management Seattle trusts! Weissman, Barbara N. W. Imaging of Arthritis and Metabolic Bone Disease. Philadelphia, PA: Mosby/Elsevier, 2009. Print. Smith, Howard S. Current Therapy in Pain. Philadelphia: Saunders/Elsevier, 2009. Print.